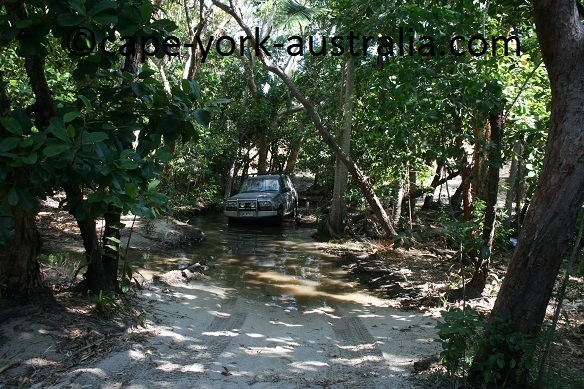 Cape Melville national park is a bit off the beaten track. 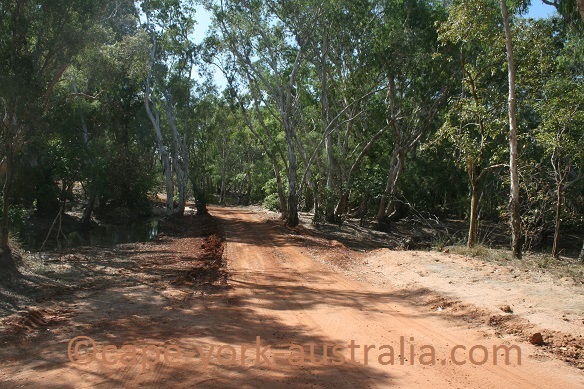 It is not exactly remote, but it's still far enough from the Peninsula Developmental Road in the west, and Cooktown in the south, that it is less visited. 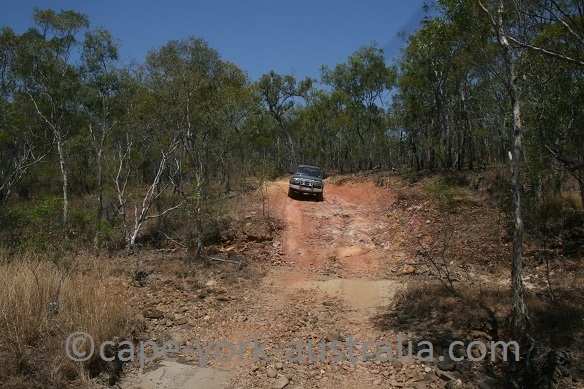 Most Cape York travellers don't usually get time for it, and it is more popular with long time campers who only come here and stay for weeks. It is a great place to camp and fish, or go bird watching or mud crabbing. 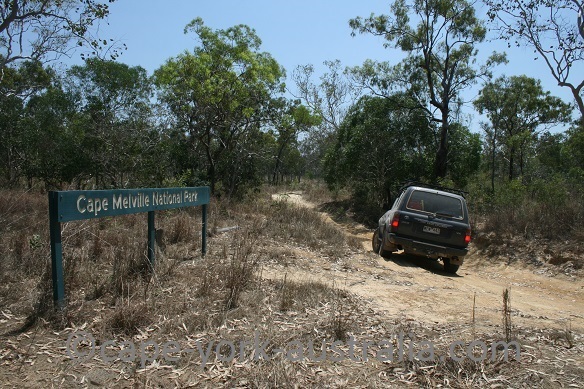 Most people enter the park from the west, coming either from Musgrave or Laura on the Peninsula Developmental Road, and then driving through Lakefield National Park. 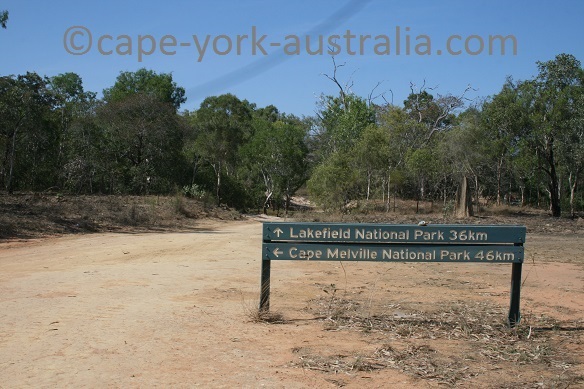 Lakefield - Cape Melville junction. This is a reasonable gravel road, not like a small four wheel drive track. The road in from Lakefield National Park. Others come from the south via Cooktown, Battlecamp Road and Starcke Wakooka Track. This road starts off being a reasonable gravel road, but ends up being a slow and narrow four wheel drive track, which is a lot of fun! 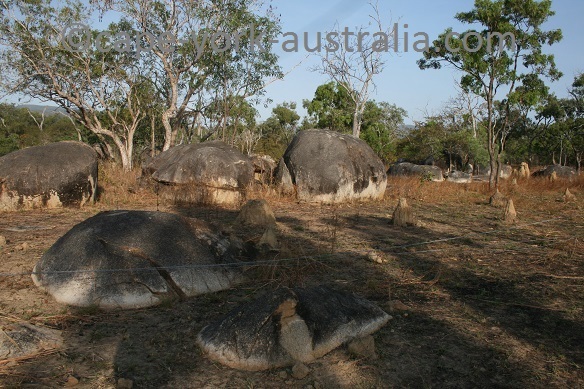 Cape Melville NP, southern section. Whatever way you do, you finally get to the northern section's park entrance north of Wakooka. The northern section park entrance. 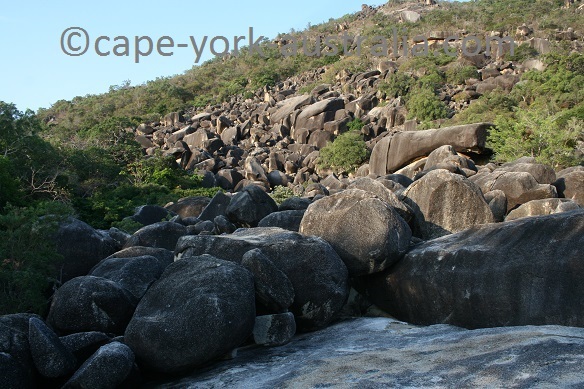 Then pass some granite boulders, after which the road is quite rugged all the way to the Cape, and four wheel drive only (even in case you would not use the 4WD gears, you need to travel in a 4WD vehicle just because it's higher). 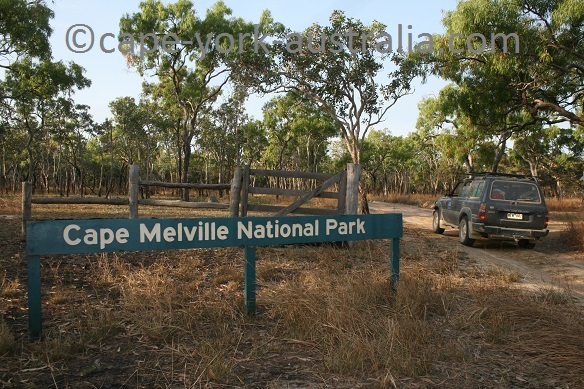 At Cape Melville, there are camping spots next to the beach that starts on the left hand side of the carpark. 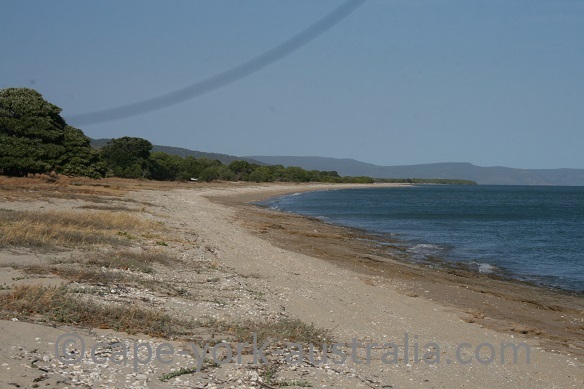 In both ends of that beach are creek mouths that are great for fishing and mud crabbing. A creek along the drive between the northern and the southern beach. 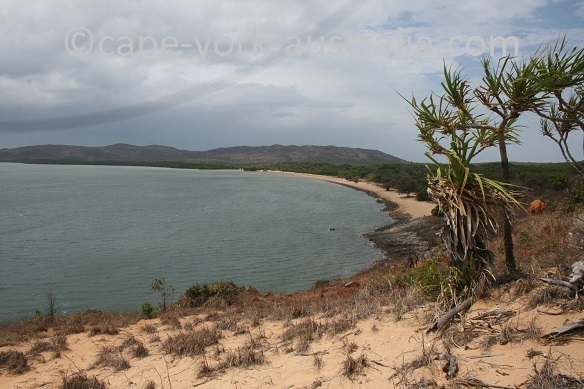 ... you will get to the northern beach, from where you can drive along the beach, at the low tide, to the tip of Cape Melville. The cape from the northern beach. At the actual cape, there is a monument for the 300+ pearlers who were killed in 1899 in the tropical cyclone Mahina. 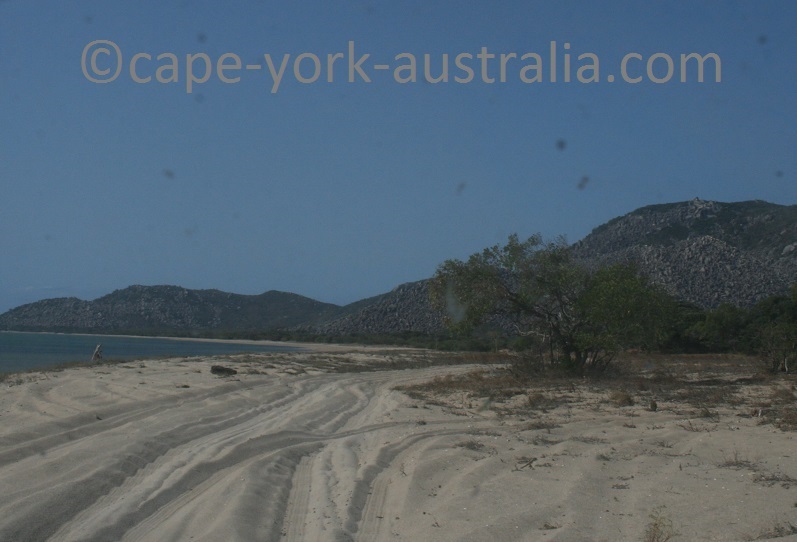 On the way to and from Cape Melville, about half way to Wakooka, is the turnoff to Ninian Bay. 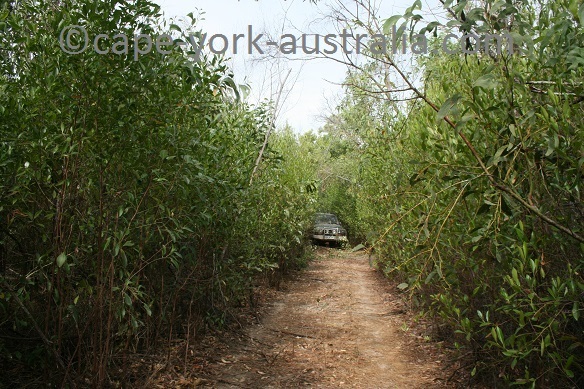 The track is narrow and at times almost overgrown. Once at the bay, there is a beautiful beach. In the northern end of the beach is a rocky headland where you can climb to the top of the hill for views over the bay. 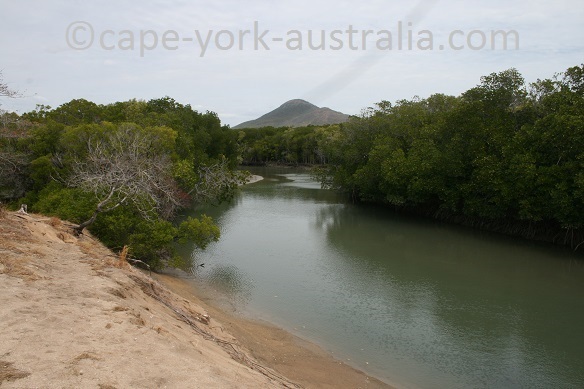 In the southern end is is a river mouth with mangroves - which, as you would know, means good fishing and mud crabs but also crocodiles.